Wisecracking Beverly Hills brat Rachel Buchanan doesn't exactly have an ordinary life. For one thing, she attends Blackthorn Academy, which is secretly a training school for spies. Then there's her arch–nemesis, who's convinced that Rachel is this ancient goddess reincarnated to stop his evil plans. It all sounds pretty lame to Rachel. 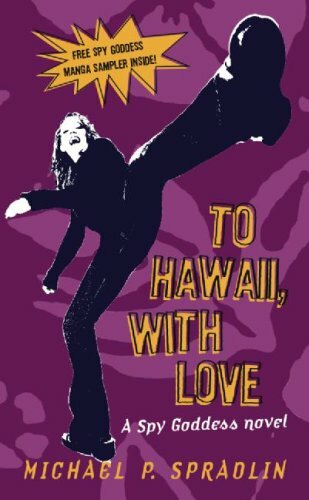 But then she discovers that the bad guy's trail leads directly to Hawaii...and surely there'll be some time for surfing in between all the getting kidnapped and leaping out of helicopters–right? Oh man, this was a fantastic read! !As much as I liked the first one, this one was even better! This book picks up right where the first book leaves off. Rachel and her friends have to stop a madman who plans to call up a big ole mythical baddie to over take the world. the problem is that the madman thinks that Rachel is an accent goddess reincarnated and is the only person that can stop him and his evil plans. That means it's pretty much open season on Rachel and her friends. Rachel is a fantastic character! She's smart, strong, and has a smart mouth that adds a lot of comedy and laugh out loud moments. This is such a great read. This has it all, comedy, action, adventure, mythical baddies and creatures. I can't say enough good things about this book. If you start the series, I can **promise** you won't be sorry.Start the series, and enjoy the ride, I know I did! I first discovered Rachel Buchanan and Blackthorn Academy in the first book, LIVE AND LET SHOP. Well, she's back with more adventures. One of the seven ancient artifacts to summon Mithras, the God of Chaos, is in Hawaii. It is up to Rachel Buchanan to retrieve the artifact to Blackthorn Academy. If you remember, the academy sits on top of a sophisticated crime lab and Rachel is training to be a spy. There's just one problem. Her and her friends have to fight against Simon Blankenship. He thinks he is a reincarnated Mithras. When one of her friends is in danger, it's up to Rachel to do what it takes to save her friend. My daughter says, "This series is full of action. I just love it." Awesome Spy thriller! Better than the first! Wow! This book is so great! If you love spy thrillers with many twists and turns this is the book for you! I read it in like 2 days! It keeps you hooked and wanting more!You just keep reading page after page wanting more information! Cliff hanger chapter endings that you want to stop but just can't! Amazing book! Got this book for my grandaughter, who normally does not like to just sit down and read. It has been wonderful.This is the second book that she has read of this author and was wondering if there will be any more. Thank you for such wonderful text to enthrall young teenagers.